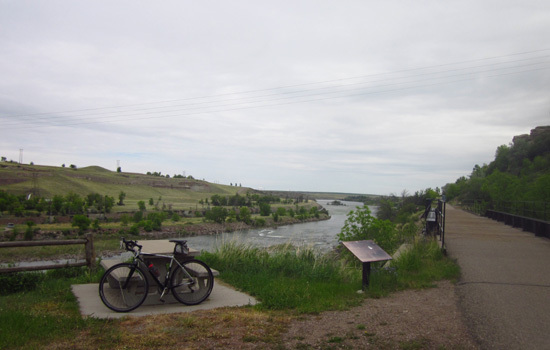 SUMMARY: OUR VISIT TO GREAT FALLS, MT. communication with the waters of the Pacific Ocean . . .
across this continent for the purposes of commerce." And thus began one of the greatest expeditions in U.S. history, Lewis & Clark's Corps of Discovery that stretched across the continent and produced a "boatload" of scientific and geographic information. 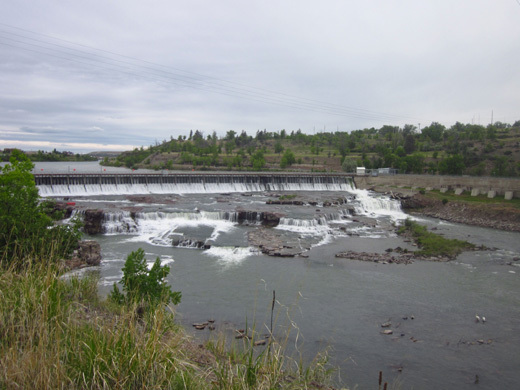 Part of our exploration of new territory this summer included spending some time in Great Falls, MT, where the Lewis & Clark expedition spent several grueling weeks portaging boats and tons of supplies for 18 miles around five Missouri River waterfalls in what is now the Great Falls area. At least two of Great Falls' five falls are now dammed but you can see the rock ledges. 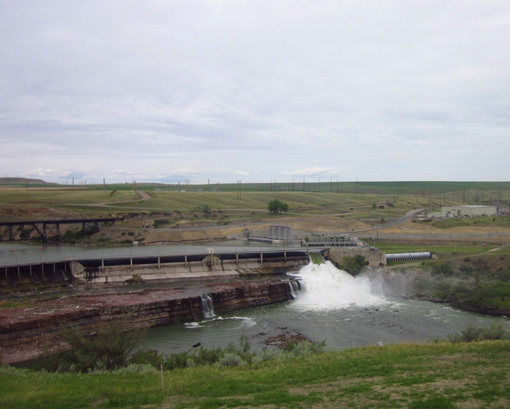 Black Eagle Falls & dam are above, Rainbow Falls & dam are below. 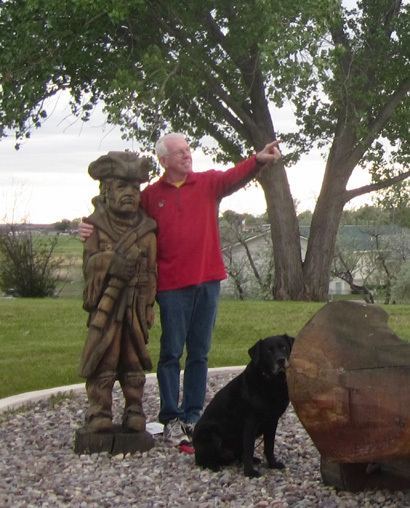 Jim and I have read a lot about this expedition over the years and have seen other sites where Lewis & Clark left their mark, both literally (like Pompey's Pillar near Billings) and figuratively. 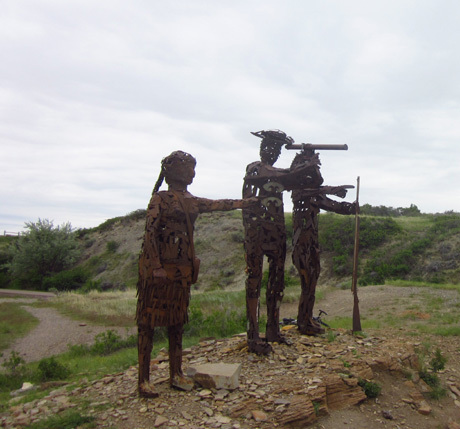 Neither of us has spent time in Great Falls, however, to see some of the falls and visit the Lewis & Clark National Historic Trail Interpretive Center, managed by the USDA/Forest Service. 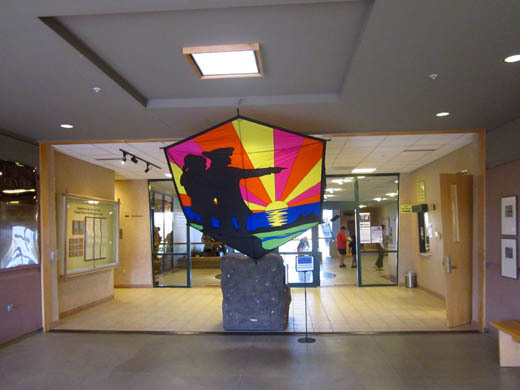 Colorful kites graced the entrance and atrium of the museum this week. We were impressed with the exhibits, films, and attentive volunteers who staff the museum. Go see it if you're in the area. There is an admission charge but it's free if you have a National Park Service pass. We arrived at Gateway FamCamp on Malmstrom AFB on Wednesday after driving for parts of three days from the USAF Academy in Colorado Springs. 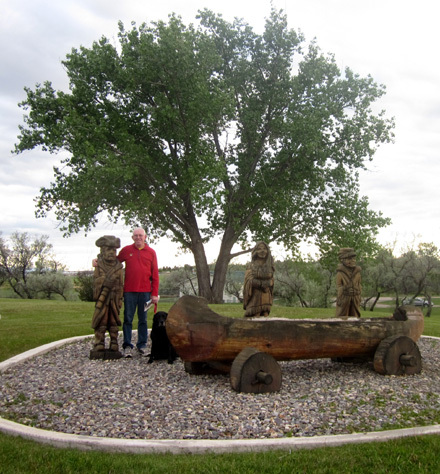 of Lewis, Clark, Sacagawea, and one of their boats are at our campground. 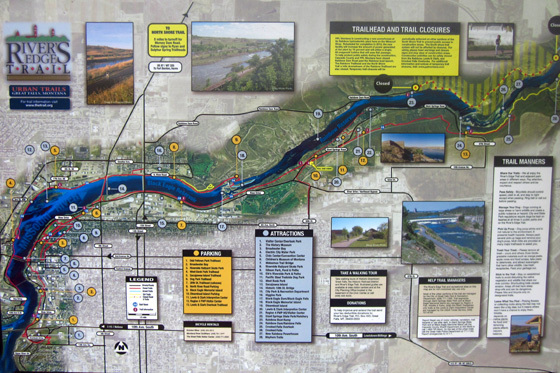 Great Falls is our final �staging area� for our trip to Alaska. A common eastern route to the 49th state enters Canada a couple hours north north of Great Falls at Coutts, Alberta and heads north and west to the southern terminus of the famous (notorious?) Alaska Highway. We needed to do some final preparations, such as loading up on tax-free supplies at WalMart and Sam�s Club (Montana has no sales tax). 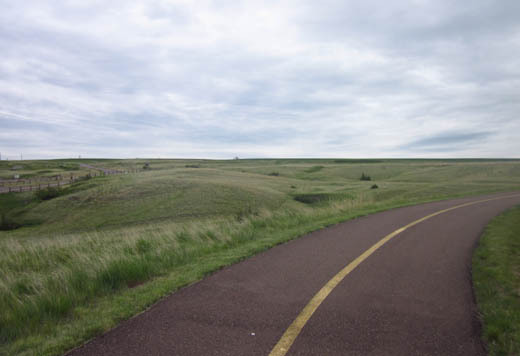 We also had time to do some more trip research, ride the long bike trail along the Missouri River, and see some area sights like the Lewis & Clark center. 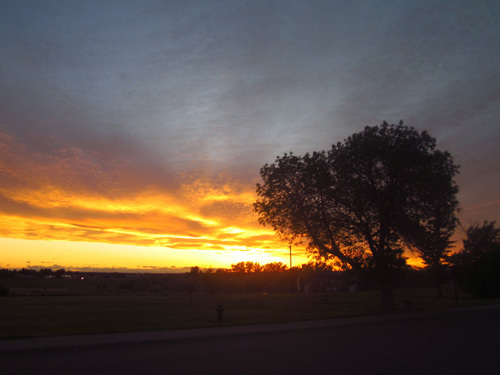 We're enjoying three quiet nights at Malmstrom AFB. No noisy planes here, just helicopters and missiles (no, they don't test those in the city). The pull-through, full hook-up sites at Gateway FamCamp are spacious. 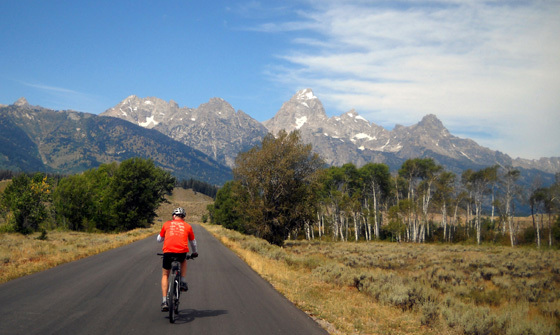 We can recommend the campground if you're active or retired military. 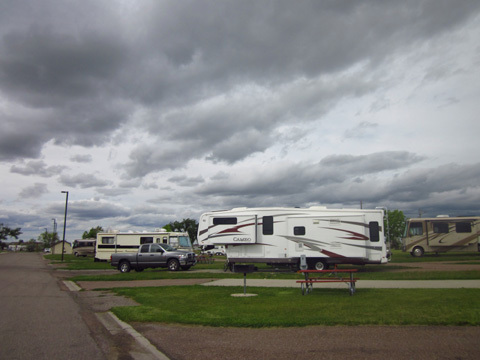 Cody loved all the acres of thick lawn and prairie grasses surrounding the campground. He also went nuts trying to catch the gophers whose holes make walking in the grassy areas a bit treacherous. We're already noticing how late it gets dark and we've barely begun our journey north. The weather looks good for the next week through Alberta so we plan to leave Malmstrom tomorrow morning. I'll fill in the details about our visit to Great Falls and add more photos sometime in the future (don't hold your breath!). Meanwhile, hit "next" and keep reading about our journey through Canada.